Able to claw straight up a brick wall, squeeze through a pipe the width of a quarter, and gnaw through iron and concrete, rats are also revealed in this fascinating book to be incredibly intelligent and capable of compassion. 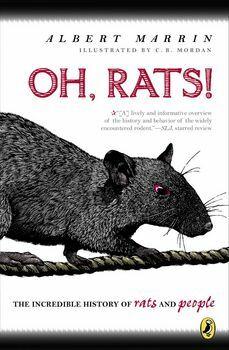 Weaving together science, history, culture, and folklore, award-winning writer Albert Marrin offers a look at rats that goes from the curious to repulsive, horrifying to comic, fearsome to inspiring. Arresting black-and-white scratchboard illustrations with bold red accents add visual punch to this study of a creature that has annoyed, disgusted, nourished, and intrigued its human neighbours for centuries. A nonfiction examination of the scientific and historical wonder that is the rat—now in a brand new digest format!